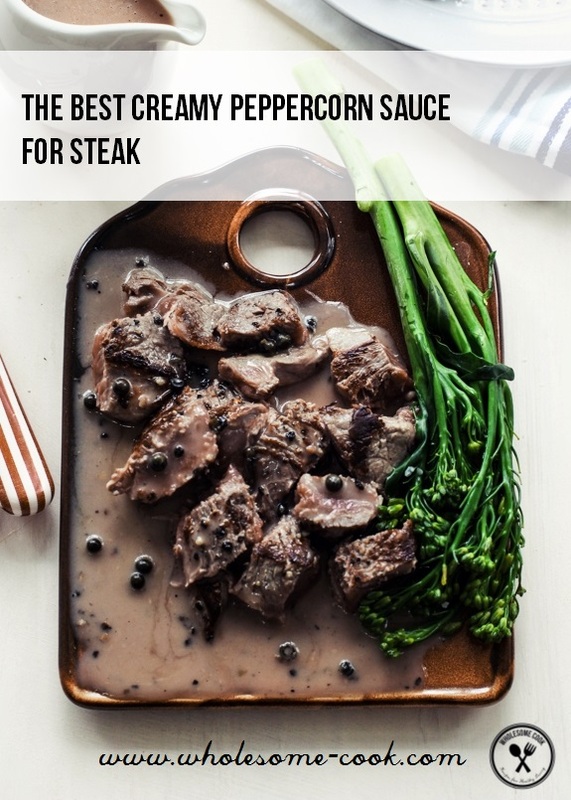 This Creamy Peppercorn Sauce for Steak, made with green and crushed black peppercorns, beef stock and a hint of cream is one of our favourites. We find this version particularly good for steaks, roasted chicken, schnitzel or even fish. Print or bookmark to save. Tuesday is steak night at our local pub. Made even more exciting by the fact that it is only on Monday and Tuesday nights that steak there comes with a choice of either the creamy peppercorn or mushroom sauces. Both are our equal favourites, second only to our interpretation of Neil Perry’s Cafe de Paris butter. So, rather than choosing we quite often just have both. Indulgent, I know. 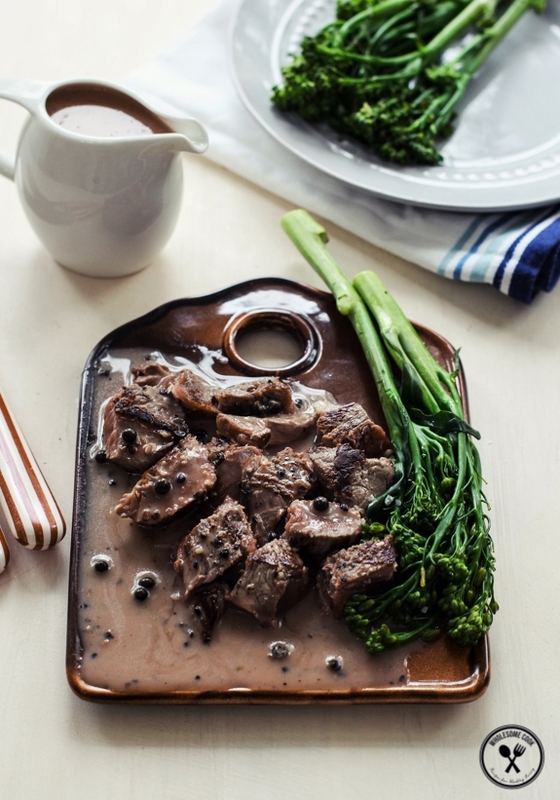 This simple peppercorn steak sauce, just like our favourite mushroom steak sauce, is a tasty addition to many dishes – not only beef, but also chicken and even fish. In fact, it can be stirred through some pasta or served as a gravy on mash and veggies. While a traditional peppercorn sauce is made with beef stock and a splash of brandy, I prefer the ease of using red or white wine. For steak, I would definitely suggest making the red wine based sauce, adding beef pan juices to further intensify the flavour. A dash of brandy, port or sherry, but no more than a tablespoon is also great if you have some. No matter if you don’t. For chicken and fish white wine might be more suited than red and I would suggest omitting pan juices in case of the fish. 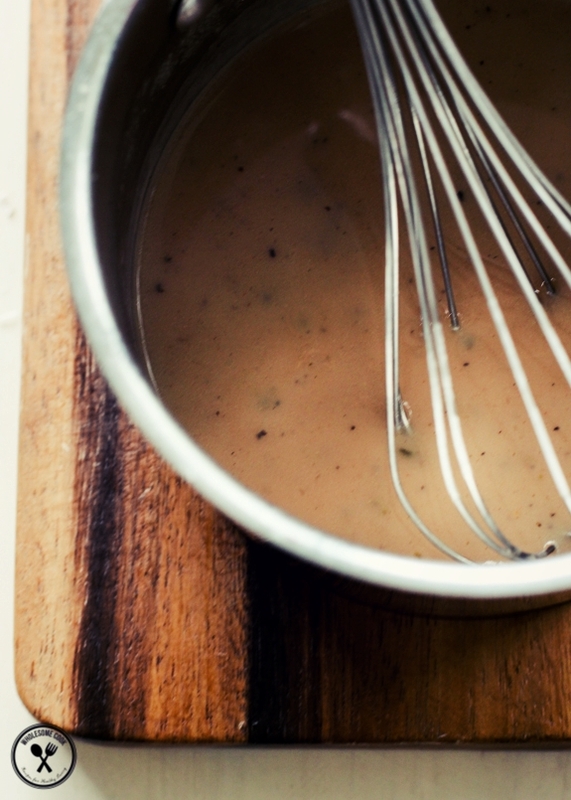 If you are interested in other simple and delicious sauces for steak, try the Creamy Mushroom Sauce, Cafe de Paris Butter sauce, Vanilla Bean Hollandaise or my Asian-inspired Chimichurri. Thrifty Tip: you can freeze leftovers in an ice cube tray and use the wine cubes to add flavour to sauces, soups and stews, if you are anything like me and hardly ever finish a bottle of wine before it spoils. It’s a great way to add flavour to many dishes and avoid waste. 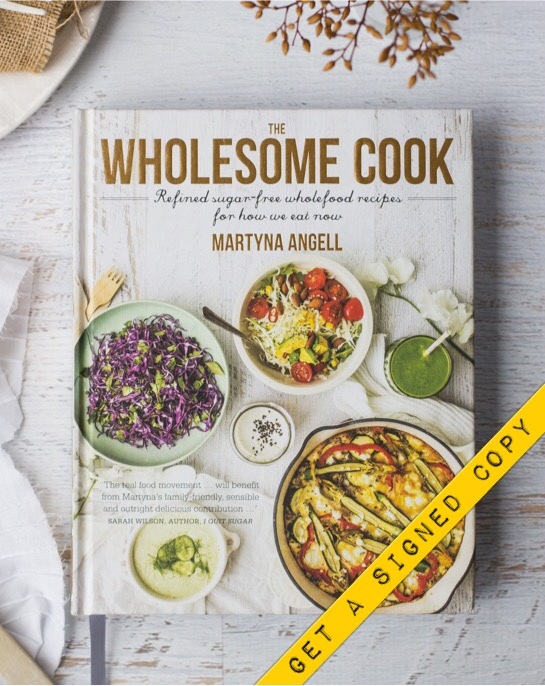 For more healthy living inspiration check out my debut cookbook, The Wholesome Cook, featuring 180 refined sugar-free recipes all with gluten-free options. 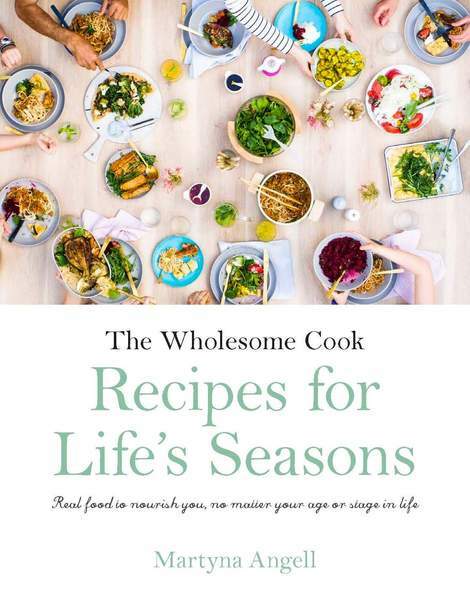 Plus detailed additive-free shopping guides, wholefood kitchen tips and my take on sugar, fat, gluten and legumes, soy and dairy. 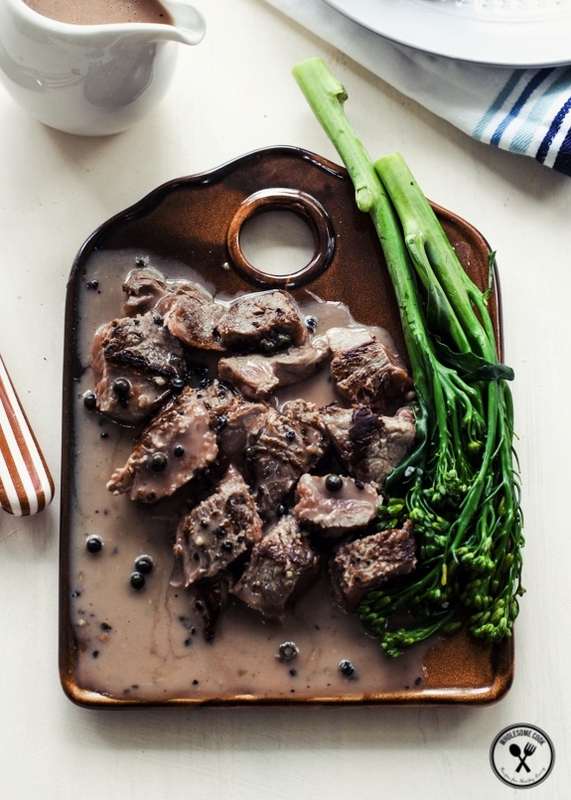 Green peppercorns provide another dimension of flavour and texture to this peppercorn sauce. You can also whisk in some onion powder to the sauce before serving, or if you like mushrooms try adding some porcini powder to the sauce as well. Leftover wine frozen into ice cubes is perfect for this sauce recipe and helps stop waste. In a small saucepan melt butter over medium heat. Add green and black peppercorns and cook for 20 seconds in bubbling butter. Add stock, wine and bring to a boil, then simmer for 5 minutes to reduce the sauce and cook off the alcohol. Add cream and cook for a further 5 minutes for the sauce to thicken slightly. Whisk in onion powder, if using, and arrowroot (tapioca flour) mixed in with two teaspoons chilled water. Whisk for a further minute for the sauce to thicken. Serve over steak, roasted chicken or schnitzel. You can keep leftover sauce in the fridge for up to 2 days. Reheat on the stove top, adding a dash of extra water if necessary, or in a microwave. that first photo is breathtaking! So rustic and deep. Printing the recipe to try with steak tonight (change of plans after finding this). We have always loved the mushroom sauce of yours so this will definitely be a nice alternative. I especially like the inclusion of both black and green peppercorns. Delish! i loooove peppercorn sauce! your looks perfect! Delicious! Made this tonight and it was perfect! I didn’t have any onion powder but added some garlic instead. Worked a treat. Oooooh yes!!! Thank you for this. I’ve always been too scared to make this myself. No more packet mixes for me. There is nothing like a little steak sauce made with love to make one fantastic steak. Bring it on! Creamy pepper sauce works SOO well on steak. I love it. My hubby loves his steak but really loves it smothered in a great sauce, and this is it I think. I had to go get something to eat half way through looking at these pictures. 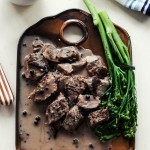 I love steak & pepper sauce and these look absolutely delicious! The flavour in Green Peppercorns is delicious. Love this recipe! I’ve been searching for a recipe for green peppercorn sauce and this sounds fabulous. Going to make it this week-end. This was yummy, top marks. Thanks for posting this recipe. This looks amazing. Where did you get that plate? Reading the instructions…. When does the brandy go in??? Thank you so much for sharing this recipe. Divine!!! This sauce is amazing. I followed the recipe exactly (used white wine and did not add brandy) and had it with pork schnitzel. Delicious! Thank you. Best peppercorn sauce ever. Easy to make too, no faffing ! i made this sauce, I followed the directions exactly. And it came out way too thick. It seems like the liquid measurement is not correct. I added about 2 cups of additional beef stock and then it was very tasty. Also when do you add the brandy? I made this with mushrooms and red onions. Best of both worlds! Might cycle to the shop and grab some green peppercorns!